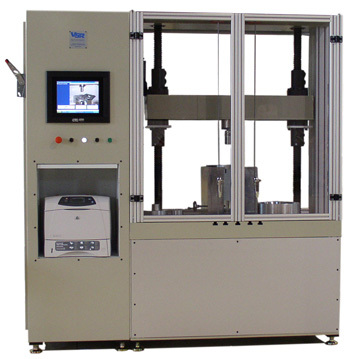 This machine is being used for performing destructive compression tests on various torque converter components to measure data such as weld and stud strength. Rigid Load Frame - The tester is capable of withstanding loads up to 25,000 lbs. Closed Loop Control - Utilizes a motion control computer card for tight position & speed control. Capable of controlling speeds as low as 0.001 mm/s. Multiple Test Fixtures - Our tester comes with fixtures for performing standard compression strength on a wide variety of parts all with easy changeover. Overlaying Graph Display - The graph screen features include automatic and adjustable scaling. Up to 10 tests may be shown at once. Touch Screen Control - The computer system includes a 15 inch touch screen. The software is optimized to allow all test and control features without the use of a mouse or keyboard. 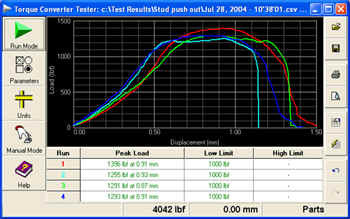 Easy Test Construction - Automatic tests can be created and saved by making just a few settings. When it comes time to run a test, the operator simply loads the part, selects the test type, and the test begins.